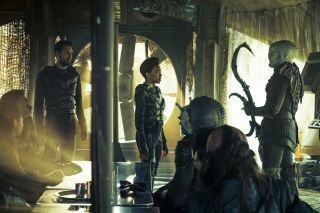 Michael Burnham (Sonequa Martin), center, has a really bad day in "Star Trek: Discovery" Episode 11, "The Wolf Inside." Warning: This recap includes spoilers for "The Wolf Inside", Episode 11 of "Star Trek Discovery", and also includes discussion of sensitive and potentially triggering topics. This week's episode opens with Michael Burnham (Sonequa Martin-Green) musing on her current predicament. She's stranded in an alternate universe and pretending to be a sociopathic captain on the I.S.S. Shenzhou for the evil Terran empire, all to gather top-secret intelligence on how her real crew on the U.S.S. Discovery can escape this universe and get home. "I can't rest here, not really," Burnham says in narration in the episode's opening moments. "My eyes open, but it's like waking from the worst nightmare I could imagine. Even the light is different. The cosmos has lost its brilliance, and everywhere I turn, there's fear." Burnham – who doesn't really want to kill the rebels – beams down to the planet with Tyler and outlines a plan to allow the rebels to escape their base; she promises that Shenzhou will only destroy their infrastructure after the rebels have left. Voq invokes the name of the deity Kahless while in negotiations. And that sets Tyler off. Tyler begins fighting with the Klingon just moments after Burnham got the rebels' uneasy trust. To the rebels' credit, they figure out that Tyler had a crazy moment and they continue to trust Burnham, but Burnham knows now that Tyler has been hiding something. The two beam back to Discovery and have a private conversation. Tyler admits his human body and mind has been melded into that of the real-universe Klingon Voq – so to be clear, Tyler/Voq got "triggered" because he met the alternate-universe Voq face-to-face. Tyler also admits to killing Dr. Culber (Wilson Cruz) in the last episode. Then he tries to kill Burnham, but alternate universe crewmates aboard the U.S.S. Shenzhou break in to the room and haul him away. While the Klingon revelation was no surprise to astute fans, Burnham's distraught performance as she learned this was a treat to watch – we've all been through awful breakups like that, but this is even worse than those breakups as the fate of the entire universe is at stake here. Burnham gets temporary revenge when the U.S.S. Shenzhou crew sentences Tyler/Voq to death and she personally beams him into space. I actually thought Burnham was going to kill Tyler/Voq, but no! He was quickly beamed to safety on board the waiting U.S.S. Discovery and sentenced (under Starfleet rules) to await judgment in the brig. I laughed out loud, however, when we learn that Burnham smuggled the secret escape plans into the uniform of Tyler/Voq. She's a crafty leader and getting smarter by the episode. Culber appears to be really dead, as we see Cadet Sylvia Tilly (Mary Wiseman) and Lt. Saru (Doug Jones) discussing it. While they think that it was probably the very ill Paul Stamets (Anthony Rapp) who did the deed, there is doubt in their words – they wonder if there is a murderer running loose on ship. Despite Tilly's and Saru's words, however, a recent TV Guide interview with a showrunner of Discovery did promise Culber will return in some way. Maybe he somehow resurrects. Stamets was still out of it at the beginning of the episode, at one point yelling, "The forest is dark, but I can still see him through the trees," while cradling the dead Culber. Tilly treats Stamets for his illness by releasing mushroom spores around him; she thinks his special connection to the spore network that enables Discovery to travel fast, also requires Stamets to be connected to the spores all the time to stay healthy. Turns out Tilly was right. I'm going to break your brain in moment, so forgive me here. At episode's end, Stamets meets his alternate-universe counterpart in some sort of alternate-alternate universe. (Hey, we all enjoyed "Inception", so let's just go with this for now.) And yes, they're inside a forest. "Ready to get to work?" alternate-Stamets asks. "I so hoped you would find your way." By the way, I'm assuming this encounter is for real and not some sort of delusion on the part of Stamets, but I can't say for sure yet. We finally get to see the emperor of this evil Terran empire – turns out that she's the alternate universe counterpart of Captain Philippa Georgiou (Michelle Yeoh), who died way back in Episode 2. She starts massacring the rebel alliance and demanding Burnham answer for why she didn't do the same. "I do not appreciate having to warp my way across the quadrant to clean up your untended mess. When I give an order, I do not expect to be ignored," alternate-Georgiou says. And cue cliffhanger. We'll learn more next week. From left to right: Doug Jones as Saru and Mary Wiseman as Cadet Sylvia Tilly in "Star Trek: Discovery" Episode 11, "The Wolf Inside." Yes, I didn't cover some of the other alternate universe appearances of other characters yet. It was so sad to see that alternate-universe Saru is a slave and has no name, isn't it? Although he does prove to be brave in the end, since he's the one who saves Burnham from the murdering Tyler/Voq. I'm still confused about the behavior of alternate-universe Sarek (James Frain) after he mind-melds with Burnham, to tell the rebels whether or not she's speaking the truth when Burnham says she wants to help the rebels. Burnham's mind-meld basically revealed her whole past life to Sarek, but he only talks about what the rebels need to know: "I see a world bursting with potential, and a child molded by wisdom, and a seemingly impossible depth of human compassion. She means us no harm." Did Sarek – the person who raised Burnham in the real universe, after all – understand that Burnham comes from another universe? If so, why didn't he say anything? We'll likely have many more of alternate-universe encounters of crew members in the coming weeks, so get ready. The burning question for me – where is alternate-universe Ash Tyler? Was he also fused with Voq? Anyone else getting really, really annoyed when Tyler/Voq begins to experience flashbacks yet again? Especially when they're only a couple of seconds long and it's hard to see what's happening? There was an extended sequence of brief flashbacks during his reveal to Burnham, with things passing by so quickly that it was hard to quantify their relevance to the plot. A brief description of the Tellarites, for those who don't know: this alien species was mentioned mostly in "Star Trek: Enterprise," according to fan site Memory Alpha. Besides their distinctive beards and short stature, they are said to enjoy debates and arguments – which makes them good politicians. In this episode, they have tusks! This was one of the longer Discovery opening sequences before the credits, clocking in at about 14 minutes.